Saturday morning found me heading out on the bus with a leather jacket and clutching my open helmet to head to Metropolis Motorcycles to pick up the Sprint. And so it was that I got off the train at Vauxhall and wandered over just as they were opening … which was just as well as it was filling up for “Crash a Triumph Day” aka Triumph Open Day with test rides aplenty. 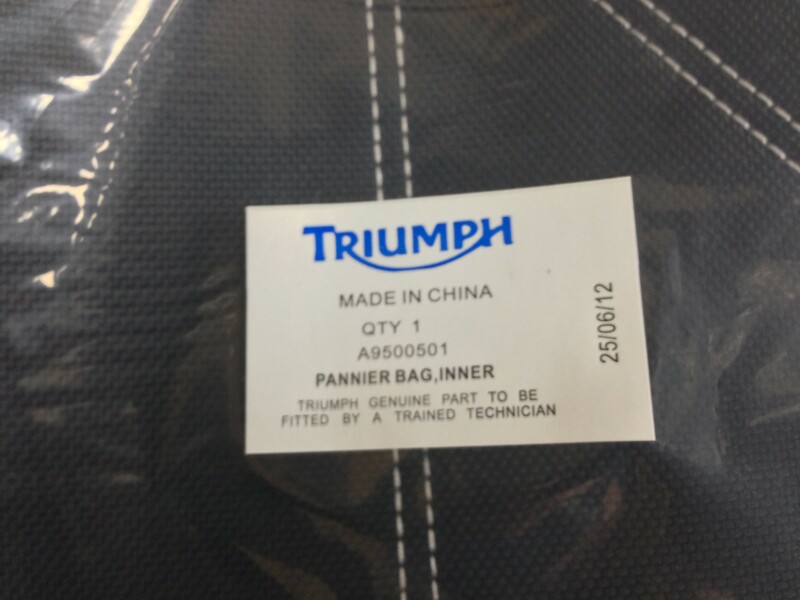 After we’d done the paperwork and I’d laughed at the stupid warning label on the pannier liner bags (have I got to take a Triumph Technician everywhere with me? ), I fired up GT with its 3.1 mile mileometer (or odometer as Triumph refer to it) reading and headed home via a petrol station to fill the tank right up. 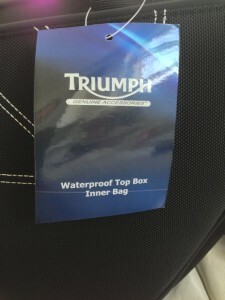 It was handy having the top box as well because I could put all my paperwork – in a neat Triumph pouch – and a Triumph T-shirt and mug in the cavernous boot. Top Box Inner Bag. Really? So home, arriving with a little over 6 miles on the clock. This has the added benefit – having removed the baffle – of releasing a lovely, deep growl from the triple engine without being too noisy, thanks to the catalytic converter in the headers/collector box (I only swapped out the silencer). 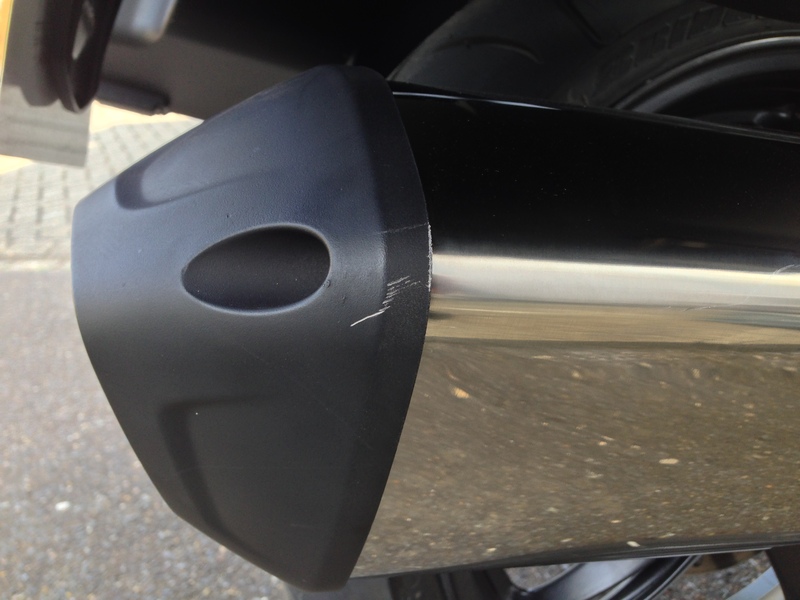 Start to finish, it took me 10 minutes to fit this carbon fibre Remus Hexacone silencer. Lighter weight, smaller, shorter and better looking. And it makes the popping and banging on the overrun even better! I then spent another 5 minutes taking off all the warning stickers from the tank before they get a chance to harden and take hold on the tank. Marvelous! The next job was to fit the RAM mount for the satnav to the fork tops and then wire up a power lead to plug into the accessory socket. Sadly, this wasn’t actually putting out any power (and neither were the heated grips which share the same circuit) so that’s another job for the dealer to sort. I wired up another lead direct from the battery to the new powered satnav cradle from Amazon… which is also DOA! 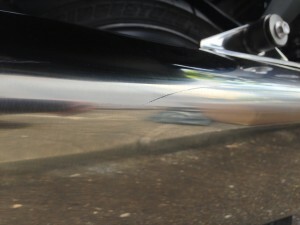 So the morning had taken a slight turn for the worse … which got much, much worse when I scraped the left pannier going into the garage due to my misjudging the width at the rear – the bike’s wider at the back than the front, even with the wide mirrors. Arse! Out with the T-Cut paste. Finally, it was time to change into my black race leathers and matt black Arai for the full stealth effect. High viz? Schmy viz! Then off to Egham to drop off some apartment keys for Amy and then on to Epsom and the other GT for dinner. Sunday morning and I was up and out of the house by 8.00am as I was heading down to the National Motor Museum in Beaulieu to meet up with friends for breakfast and a natter. 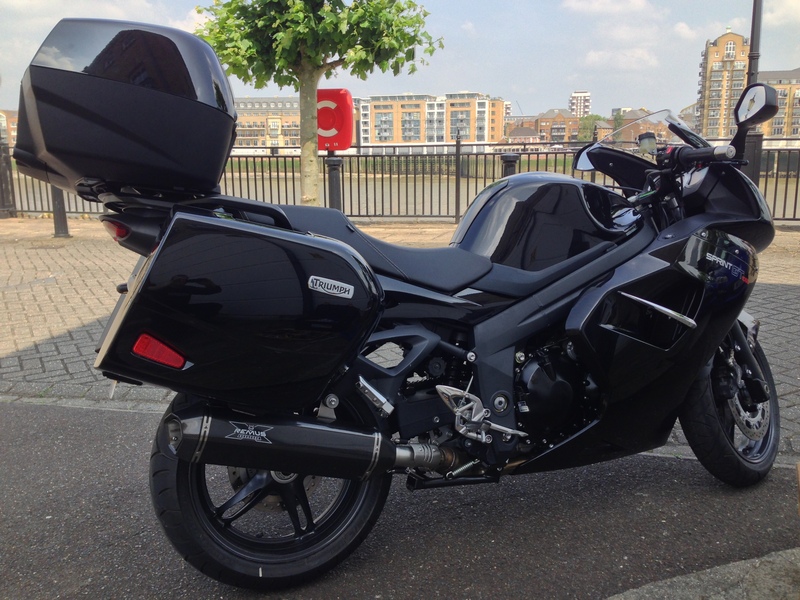 I chose the A3 as it was a nice mixture of roads and off I went, keeping the revs and throttle openings to a modest amount as I’m running the bike in. Playing with the trip computer showed that the GT was giving over 50mpg at 90mph – on closed roads, obv! – and even with all the town riding was averaging 46mpg with a range of a little over 200 miles. Some slight tingling through the bars at around 90 as well, so I will need to keep it just under or just over on Eurothrashes. After a lovely time with mates, I headed back to Epsom where the other GT had finished a difficult half-marathon – “demanding”, said the website – especially in the heatwave. I was pleased to have avoided it on doctor’s orders after my GP and Consultant had told me to rest my duff knee until it’s fixed. On the way back up the M3, a crash had slowed traffic to a halt so I was able to see what it was like to filter with the additional width. It was OK: I just had to be a little more careful and filter with less extreme prejudice than usual. Then in the evening it was back home through more heavy traffic up to Wandsworth and a weekend of around 250 miles. 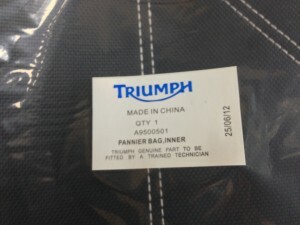 Here I go again: another bike, another blog. 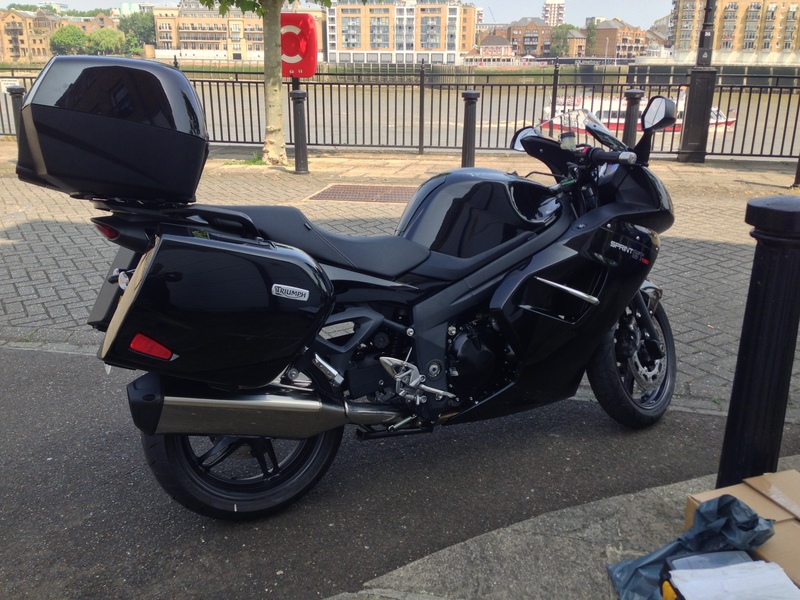 A test ride has been arranged for Saturday, 22 June 2013 for me to try a Sprint GT for size following on from my Pyrenees trip a week ago when I decided to bite the bullet and blow some cash on a sports tourer for serious mileage.